I was born one day before Miguel Cabrera turned 7 years old. Maybe his parents could tell by that age what their son would grow to become, but his superhuman talent probably wasn’t evident by mid-April 1990. On that day, 22 men could claim to have hit 400 home runs in the major leagues. The list started with Aaron and ended with Snider. Tiger great Al Kaline was one dinger behind, at 399. A lot has changed since then. Last night, Adrian Beltre became the 52nd player homer 400 times. Sometime in the next few days, Miguel Cabrera will become number 53. 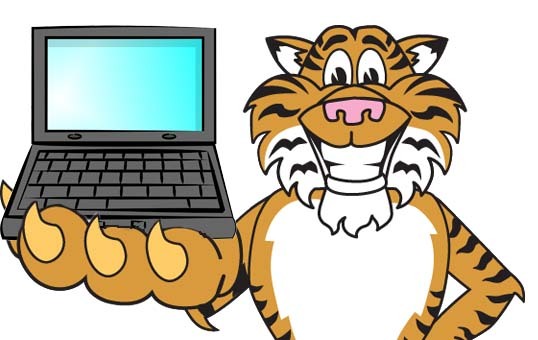 In the last 25 years, the tools of baseball analysis have improved dramatically. Home runs are still the best thing a hitter can do in the box, but we have a much better understanding of how to best evaluate performance beyond homers, RBI, and batting average. And we’ve also lost a little love for home runs and round numbers in general in the aftermath of the steroid era. The 400 HR club is 241% as large as it was the day I was born. Whatever the cause, whoever is to blame, hitting 400 HR isn’t a particularly awe-inspiring feat anymore. It’s a milestone en route to bigger ones. Miguel Cabrera’s been a great player virtually since the moment he arrived in the majors. He walked off in game one and won a World Series before he played on Opening Day. In his second full season, he was a star. He’s fallen short of 5 fWAR just twice in his career. In both of those seasons, he was still 30% better than the average hitter. We all know about Cabrera’s defensive limitations. At his size, it’s quite difficult to be a great defensive player, and that’s going to keep him from winding up as one of he best players ever. He’s ranged from average to awful in the field, and he’s probably going to be a designated hitter by the end of the decade. But these are reasons that Cabrera falls short of Bonds and Mays and Rodriguez. He’s not Babe Ruth or Ted Williams, but he’s been among the best players of his era entirely on what he can do at the plate. There are actually a lot more players (30-40) who have hit better than Cabrera through age 32, where he sits at this moment. He has a 152 wRC+, which is an era and park adjusted batting statistic. That’s among the best marks ever, but guys like Piazza, Ramirez, Bonds, Bagwell, Votto, Pujols, Thomas, and Trout (still 23) have been better with the bat through 32. 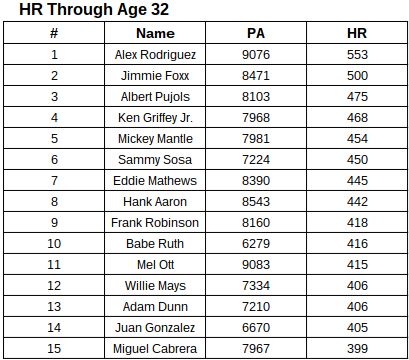 Cabrera is known for his mix of hit and power tool, but if you look only at the dingers through age 32 (Cabrera has five months left at 32), he’s already 15th on the list and should finish 2015 at 9th. Cabrera’s been injured a lot over the last few seasons and while he hasn’t spent time on the DL, his body has been breaking down and limiting his power for periods of time. Since 2010, he leads the league in fWAR and is 6% better than the second best hitter in the league with a 171 wRC+ entering Saturday. There’s no question that Trout has become the player of the 2010s and that Pujols was the player of the 2000s, but Cabrera’s carved himself a section of the game spanning both reigns despite playing on one leg for months at a time. I think Cabrera, as a player, is both vastly overrated and vastly underrated, depending on the day. Rod Allen talks about Cabrera as one of the best right handed hitters of all time. He’s not even the best right handed hitting first baseman to debut since 2000. People talk about him like he’s the best player in the game, but Trout and McCutchen and company are probably better right now. Cabrera’s body of work is impressive, but despite his excellent ability, the gap between Cabrera and Trout simply as hitters is virtually non-existent already. But on the other side of this, the fact that we’ve watched Cabrera for seven plus years now on a regular basis has also led to us to a state of complacency. Sure, Cabrera isn’t the best player to ever play the game but 60 WAR and a 152 wRC+ in about 8,000 PA is incredible. The years in Florida limit is raw Tigers value, but he’s 12th among Tigers position players in career WAR as Tigers. 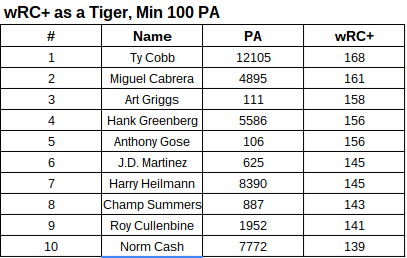 And maybe most importantly, in a Tigers uniform, only Ty Cobb has been a better hitter per PA among batters with 100 PA. There are all kinds of reasons not to care about HR number 400. It’s only important because it’s a round number, and the home run list is diluted by a massive increase in the number of home run hitters in the last twenty years. There’s more to hitting than home runs and there’s more to baseball than hitting. Cabrera is simultaneously great and ordinary. We’re used to him. I don’t even blink when he hits a pitch nine inches off the inside corner for a home run, even though no one else does that with the frequency he does. His ability to make adjustments against a pitcher within a game and hit the ball hard no matter where it’s pitched is nearly unrivaled. Cabrera is obviously the best Tiger of my lifetime and he’s going to be the first I watched to go into the Hall of Fame (shakes fist at voters for Tram and Lou). Yet there’s something so ordinary and expected about his greatness that tempers it. People will get used to anything, I suppose. Just like how I see Giants fans complaining about their team on Twitter as if they haven’t won three championships since 2010. We’ll probably have a better appreciation of Cabrera long after he’s gone. Ironically, given his huge contract that extends into era of flying cars, we’re going to watch him decline and as he starts to fail, sometime in the next decade, we’ll call back to the days when he dominated pitchers so effortlessly. To say Cabrera’s erred off the diamond would be an understatement. Sports teams and cities tend to rally around their athletes even when the athletes are at fault. They’ll boo the crap out of a guy who strikeouts too much, but domestic altercations and drunk driving are struggles to overcome rather than crimes for which to atone. Six years ago, the gifted slugger found himself drunk and fighting with his wife during the final week of a playoff run. A year and a half later, he was getting pulled over with a blood alcohol level as high as his isolated power. He’s largely gotten a pass on both incidents, at least publicly. The media and the fans forgave him or didn’t care. The organization has always played the card that Cabrera had problems and they were going to help. Whether he would say so or not, he had a problem with alcohol abuse and it led him to make bad, criminal choices. It took two rock bottom moments, but he started looking up and made changes. As a baseball player, Cabrera’s the best Tiger of the era. He’s probably given too much credit for his geniality in light of what he’s done outside the chalk, but there’s also something to be said for actually turning your life around rather than paying lip service to it until everyone forgets. Cabrera’s 400th home run will be a brief moment of celebration on the path to 500, and probably 600. He’s going to play for about ten more years and hitting another 200 HR is only going to require 20 a year the rest of the way. We won’t look at 600 the same way when Cabrera gets there as we did when Bonds crashed the club, but it’s still an impressive accomplishment. The legacy of Cabrera is probably already cemented. His early 2010s are going to be the years we remember when it comes time to eulogize his career, but the back end of greatness is often the difference between ordinary and remarkable. The all-time greats are that way because they didn’t bend to father time. Cabrera’s going to hit number 400 shortly as the capstone of his peak, but how you climb down the mountain matters too. It’s important to create opportunities in baseball but what analytics such as the flawed WAR metrics doesn’t account for is CRITICAL Situational hitting. Cabrera could go down as the best EVER critical situational hitter ever by taking the average of each situation in the decade and comparing the differentiation of the average player to the BEST player. Cabrera’s VALUE is not creating opportunities like Trout, MIGGY’s VALUE is when the TOUGHEST critical situational opportunities are created, MIGGY Capitalizes unlike Trout. It has been obvious in the past 2 seasons that not only has Cabrera been ignored as a top flight defender at first base but has been robbed of at least ONE Gold Glove. Those so called metrics prove it. The objective in baseball is simple. Have more batters cross home plate than your opponent. Neil Weinberg and WAR do not believe that situations are different and that RBI’s are outdated stats. There is a RBI% stat that CABRERA has dominated this decade while a player like Mike Trout has finished no higher than 15th in MLB with 100 opportunities. Last season (2015), Trout finished 164th ! If I was a WAR or Trout supporter then I would diminish the RBI as well.